English : Waterfall Dynjandi, Vestfirðir, Iceland. English : Outlines of the teapot and the teaspoon in the constellation of Sagittarius. Windmills in Angla, Saaremaa, Estonia. English : Windmills in Angla, Saaremaa, Estonia. English : Geerewol in Foudouk, region of In-Gall, Niger (2005). English : Gregorian Chant: "Ecce lignum Crucis"
Abandoned Icelandic turf house in the region of Búðahraun, Western Region, Iceland. English : Abandoned Icelandic turf house in the region of Búðahraun, Western Region, Iceland. Marina City is a mixed-use residential/commercial building complex located in the center of Chicago, Illinois. It sits on the north bank of the Chicago River directly across from the Loop district. The complex, that was designed in 1959 and completed in 1964, consists of two corncob-shaped 179 m, 65-story towers. English : Marina City is a mixed-use residential/commercial building complex located in the center of Chicago, Illinois. It sits on the north bank of the Chicago River directly across from the Loop district. The complex, that was designed in 1959 and completed in 1964, consists of two corncob-shaped 179 m, 65-story towers. English : Serval (Leptailurus serval) in Zoo Ostrava, Czech Republic. Early morning in Mukri bog at Kehtna Parish Raplamaa. English : Early morning in Mukri bog at Kehtna Parish Raplamaa. English : Time-lapse footage of the Golden Gate Bridge, San Francisco Bay, California, USA. Echinacea purpurea, Botanical Garden, Munich, Germany. English : Echinacea purpurea, Botanical Garden, Munich, Germany. English : Rally driver Jean Ragnotti, exhibition of new Renault car in Brno 2010, Czech Republic. The old lighthouse of Akranes is located in the westmost location of the Akranes Peninsula, Southern Peninsula region, Iceland. The lighthouse is one of the oldest concrete lighthouses in Iceland and was built in 1918. It served the fishing town of Akranes until it was deactivated in 1947 in favor of the larger structure several meters away. English : The old lighthouse of Akranes is located in the westmost location of the Akranes Peninsula, Southern Peninsula region, Iceland. The lighthouse is one of the oldest concrete lighthouses in Iceland and was built in 1918. It served the fishing town of Akranes until it was deactivated in 1947 in favor of the larger structure several meters away. English : Fashion show in year 1960 at the castle in Hooge Vuursche, Belgium. Öxarárfoss, Þingvellir National Park, Suðurland, Iceland. The 20 meter high waterfall flows from the Öxará river and is one of the most visited attractions in Þingvellir National Park, one of the two World Heritage sites in Iceland. English : Öxarárfoss, Þingvellir National Park, Suðurland, Iceland. The 20 meter high waterfall flows from the Öxará river and is one of the most visited attractions in Þingvellir National Park, one of the two World Heritage sites in Iceland. English : Chemical reaction of sodium with water. Karula National Park in winter. English : Karula National Park in winter. Red guava (Psidium guajava) in a black background. English : Red guava (Psidium guajava) in a black background. English : Moon Phase and Libration, from the Other Side: This narrated video introduces two views of the Moon's far side. Frecce Tricolori (the aerobatic demonstration team of the Italian Aeronautica Militare), intersect (head-on pass performed) during show. English : Frecce Tricolori (the aerobatic demonstration team of the Italian Aeronautica Militare), intersect (head-on pass performed) during show. Anoplotrupes stercorosus in Vassivere forest, Laekvere Parish, Lääne-Viru County, Estonia. English : Anoplotrupes stercorosus in Vassivere forest, Laekvere Parish, Lääne-Viru County, Estonia. English : Acerocnema macrocera (Scathophagidae) in copula on Corydalis sp. English : Record of the gas explosion in the Divadelní street on April 29, 2013 in Prague, Czech Republic. The railway station in Venyov, Tula Oblast, Russia. English : The railway station in Venyov, Tula Oblast, Russia. English : Storm in Madrid on 11-oct-2014, Spain. Parantica aglea, Glassy Tiger, is a Milkweed butterfly of the Nymphalid family found in Asia. English : Parantica aglea, Glassy Tiger, is a Milkweed butterfly of the Nymphalid family found in Asia. English : Bob Dylan performs The Times they are a Changin' at the White House in front of President Barack Obama at a celebration of music from the civil rights era (February 09, 2010). Panorama at sunrise of Taipei, capital of Taiwan. In the background, the Taipei 101 skyscraper can be seen. English : Panorama at sunrise of Taipei, capital of Taiwan. In the background, the Taipei 101 skyscraper can be seen. English : Video demonstrating the cooking of Chicken curry with rice. Scots pine in Kakerdaja Bog, Järvamaa. English : Scots pine in Kakerdaja Bog, Järvamaa. English : Experiment with a single growing maize root - timelapse video. 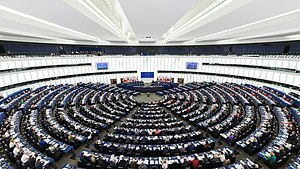 English : The Hemicycle of the European Parliament in Strasbourg during a plenary session in 2014. English : Pushing-up London Booster by David Černý placed in Prague - Chodov, Czech Republic. On Brasília's Anniversary, the JK Memorial, dedicated to Juscelino Kubitschek (1902-1976), the founder of Brasília, capital of Brazil. The building, inaugurated in 1981, was architected by Oscar Niemeyer (1907-2012). English : On Brasília's Anniversary, the JK Memorial, dedicated to Juscelino Kubitschek (1902-1976), the founder of Brasília, capital of Brazil. The building, inaugurated in 1981, was architected by Oscar Niemeyer (1907-2012). English : Animation of annual mean surface air temperature from 1970-2100, by the National Oceanic and Atmospheric Administration GFDL CM2.1 climate model. On Earth Day, a photograph of the Earth's limb as seen from the International Space Station (ISS) on Northern Brazil, during the Expedition 20. The vegetation of Amazonia, the largest rainforest on Earth, strongly influences the regional water cycle. English : On Earth Day, a photograph of the Earth's limb as seen from the International Space Station (ISS) on Northern Brazil, during the Expedition 20. The vegetation of Amazonia, the largest rainforest on Earth, strongly influences the regional water cycle. Neorthacris simulans is a wingless grasshopper, belongs to Orthacridinae subfamily under Pyrgomorphidae, commonly known as the gaudy grasshoppers. English : Neorthacris simulans is a wingless grasshopper, belongs to Orthacridinae subfamily under Pyrgomorphidae, commonly known as the gaudy grasshoppers. English : Hampton Wind Farm, Hickory Hill, Hampton. First privately initiated wind farm in Australia. English : The National Champinships Windsurfing 1975 on the Paterwoldse Lake near Groningen, Netherlands. Madonna with child and angels is a picture painted by Giovanni Battista Salvi da Sassoferrato and kept at Galleria Nazionale d'Arte Antica di Palazzo Corsini. 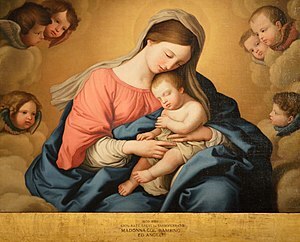 English : Madonna with child and angels is a picture painted by Giovanni Battista Salvi da Sassoferrato and kept at Galleria Nazionale d'Arte Antica di Palazzo Corsini. English : Riverside Geyser erupting into the firehole river in Upper Geyser Basin, Yellowstone National Park, USA. A road lined by Platanus × hispanica (London plane trees) and the Monumental front door of the "Manufacture des draps de Villeneuvette" (1667). Villeneuvette, Hérault, France. English : A road lined by Platanus × hispanica (London plane trees) and the Monumental front door of the "Manufacture des draps de Villeneuvette" (1667). Villeneuvette, Hérault, France. English : Zaï, an agricultural technique, in the village of Batodi, municipality of Tajaé, Niger. Naval Cathedral of Saint Nicholas in Kronstadt, Saint Petersburg. English : Naval Cathedral of Saint Nicholas in Kronstadt, Saint Petersburg. Cover of Marvel Science Stories for April-May 1939. Shows an illustration by Norman Saunders, a popular sci-fi artist of the time, meant to show a "Beauty Parlor of the Future". Eando Binder provided a column describing it, in which he went into details about electricity recharging the cells of the body, and modifying the pituitary gland - not exactly fitting with modern science, but as he points out at the end, biology wasn't so well developed in those days. English : Cover of Marvel Science Stories for April-May 1939. Shows an illustration by Norman Saunders, a popular sci-fi artist of the time, meant to show a "Beauty Parlor of the Future". Eando Binder provided a column describing it, in which he went into details about electricity recharging the cells of the body, and modifying the pituitary gland - not exactly fitting with modern science, but as he points out at the end, biology wasn't so well developed in those days. English : A video (2006) of a dog running a dog agility course. The dog is Luz, handler Olga Chaiko, course Steeplechase, location Moorpark, California. Portrait of a Carthusian (1446), oil on wood by Petrus Christus. Held at the Metropolitan Museum of Art, New York. 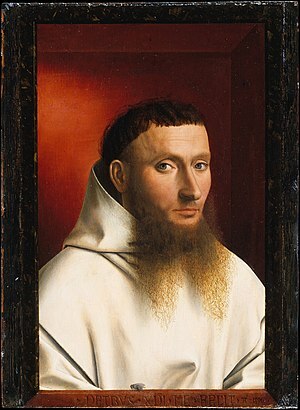 English : Portrait of a Carthusian (1446), oil on wood by Petrus Christus. Held at the Metropolitan Museum of Art, New York. English : A video showing a full ride with Mechanica at Liseberg amusement park, Sweden. Papilio polytes, Common Mormon, is a common species of Swallowtail butterfly widely distributed across Asia. English : Papilio polytes, Common Mormon, is a common species of Swallowtail butterfly widely distributed across Asia. English : Video demonstration of preparing deviled eggs.